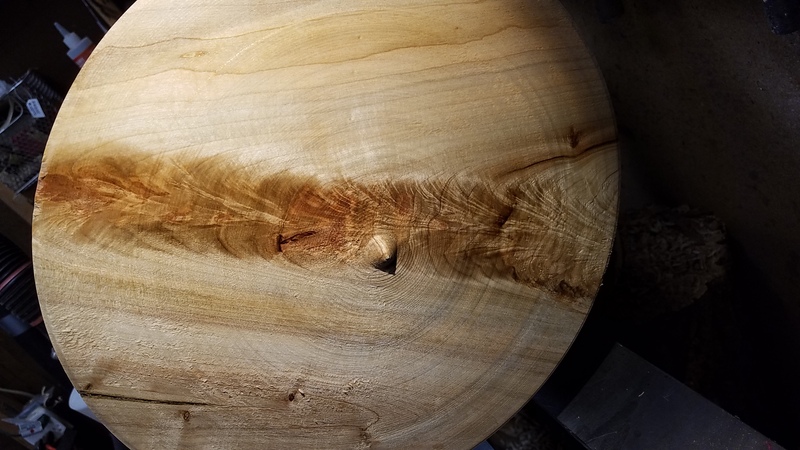 So, I am turning this silver maple crotch bowl, and I smooth out the top and find all this figure, that most of which will be turned away as I shaped the inside of the bowl. I think, what a shame...I could just pull it off and cut a bunch of pen blanks... What would you guys do? Last edited by Aces-High; 02-09-2019 at 06:10 PM. "Lenses balnks" was a typo... fixed it. What should you do Mark? I doubt you need any more "Silver Maple" Pen blanks. I would finish this bowl even if if splatters - not much lost, but much to be gained. Maybe coat the entire bowl in CA? (rotating until it is soaked in and dry?). This is not my expertise, so hopefully others will advise. If there are visible cracks durning turning, a CA coating every 5-10 passes with your gouge may be well spent. So,... if I was turning this, I'd continue as a bowl. Stabilize as needed. Wear head gear if it splatters. Plan for the worst, hope for the best! In similar situations I've switched from a bowl to a platter, plate or very shallow bowl. I've also used what would have been the bottom of the bowl to carve feet or a pedestal. Finish it as a wood replica of Jupiter. Or am I the only one seeing that? OK, a solid bowl. Don't shift now - finish and enjoy. Pen blanks will come on their own; no need to cut a very interesting bowl for a chance at good pen blanks. More will come. That's what I ended up doing. Finished roughing it out, put it in a paper bag with shavings and taped it up. I'll see it again in a few months. I don't have the patience to do that... unless it's really green and wet, I would take to finished size, finish it and set it up to admire.... if it's really wet, might run it through my microwave for a couple of passes, 2-4 minutes, let cool completely, repeat, repeat til it reaches dryness I wanted... I'm thinking silver maple is pretty stable. Wouldn't recommend using household MW... I have an old one in my shop I got from local habitat store for next to nothing... it does get a regular workout.